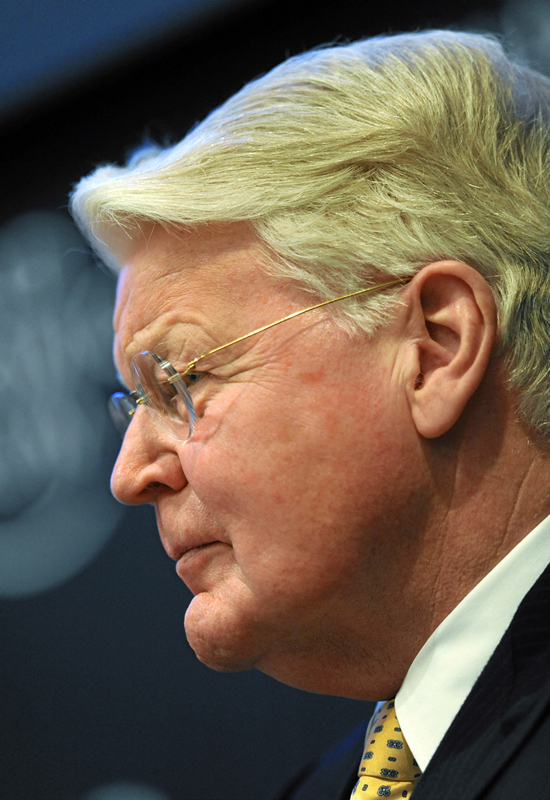 President Grimsson studied economics and political science at the University of Manchester, and in 1970, became the first person in Iceland to earn a PhD in political science. In 1973, he became a Professor of Political Science at the University of Iceland. He was the University of Iceland's first Political Science professor. He served as a Member of Althing (Iceland's Parliament) from 1978 to 1983. He served as the Chairman of the People's Alliance executive committee from 1983 to 1987. From 1987 to 1995, he was Leader of the People's Alliance; during this time, he served as Minister of Finance from 1988 to 1991 and as a Member of Althing from 1991 to 1996. He assumed office in 1996, ran unopposed in 2000, was re-elected in 2004, ran unopposed in 2008, and was elected for a record fifth term in 2012. In 2013, he announced the formation of the Arctic Circle, an organization designed for the facilitation of dialogue among political and business leaders, environmental experts, scientists, indigenous representatives, and other international stakeholders to address issues facing the Arctic as a result of climate change and melting sea ice. He is Iceland's fifth President. He received an award for Iceland's sustainable energy and economic policies in his tour of Cornell. The following is an edited transcript of his lecture. I am deeply honored to be here today and to speak about a matter which is very dear to my heart but which is also of fundamental importance to the future of our planet. But, let me first also recognize, as you mentioned this morning, when I paid my homage and expressed the gratitude from the people of Iceland to Cornell and to the people of your library for preserving here at the university the greatest collection of Icelandic books, old and new, some of them more than 500 years old, to be found anywhere outside of Iceland, and for more than 100 years this great university has preserved this collection and renewed it every year, and thus becomes the center of study and research and awareness on the great literary heritage of my country. "I come from a country where we don't need to go to international conferences to realize that climate change is really happening"
This is not just of significance to Iceland, but the sagas written in Iceland in the 12th and 13th century when the rest of Europe used Latin, are indeed to western literature as temples and ruins and Athens and Rome are also to western civilization. So why this great university preserve this collection and uses it as a forum for research and discussion, you are not just honoring my own country, you are also preserving one of the most important legacies and pillars of the western civilizations. Let me again here today in this public hall thank the university for this extraordinary contribution and all the people alive and those who have passed away for having dedicated their lives for preserving the physical collection here at the university. So in a way it is both an honor and a privilege and also a reminder of our responsibilities that I come here today also to talk about the future of our shared planet not just to pay homage to what was done in my country eight or nine hundred years ago, but also to enter into a discussion with all of you on whether we can preserve the planet eight or nine hundred years from now, even one or two hundred years from now. We are all familiar with the debate about climate change. We are all familiar with the negotiations and the dialogues and the discussions and the political conflicts. When I sometimes say, I come from a country where we don't need to go to international conferences to realize that climate change is really happening. When the rest of the world looks at the planet increasingly in recent decades from space, and hopefully realizes that it's our planet together, from a distance without differences of boundaries between nations and countries. Very few countries have had the privilege like we have had in Iceland to observe first hand both in our own country as well as in Greenland, our next door neighbor, that indeed the glaciers, the ice sheets, are melting at an extraordinary pace. We have studied our glaciers for more than 50 years, and we know that this one in just two years has disappeared recently in the way that it has grown smaller. So therefore, despite the international dialogue and discussions, we don't need to be convinced that something extraordinary is happening to our planet, and if you doubt it then you should visit Greenland, which has an ice sheet that is half the size of Western Europe and it is melting fast. If only a quarter or so of the Greenland's ice sheet melts and everything else stays the same, the global rise in sea level will be about two meters, affecting almost every city in the world, and let's remember most of the big cities in the world are indeed coastal cities, so it is a serious challenge. It is perhaps the most fundamental challenge of not just my lifetime but the lifetime of most of you who are young here today and therefore it is inevitable that we come together and try to find ways to deal with this. And there are roughly speaking three different approaches that can be taken. One was illustrated just a few days ago when president Obama and president Xi, together declared that the United States and China have reached an agreement which will gradually come into effects in the coming years with the reduction of CO2 in this country and China declaring that from 2013, it will hopefully start to reduce its carbon output. This in my opinion, historic decision, historic declaration, almost landmark in international politics and it highlights one of three major approaches to the climate change problem, that countries can together, almost unilaterally agree on a target and a principle and declare to the rest of the world that they actually are going to do it. And if every country followed that example, we will perhaps be able to escape the negotiations in Paris next year. That is the second approach that has turned out to be slow and difficult, and unfortunately not very productive. The approach of global negotiations from Kyoto onwards and although it keeps on moving like a slow train forward and hopefully will reach results. Even eternal optimists like myself do not have great hopes that through such international negotiations we will be able to solve the problem in time, because quite frankly, we had 20-30 years to take action. I have already been president for 18 years and I just mentioned that to illustrate to you this is relatively short time ahead of us to actually deal with this problem. But there is a third way also, which is illustrated by the story of Iceland, and that is perhaps why I am speaking about it here today, not just because I am the president of the country and I like to speak about my country and part is fundamental element in the job description of being a president of Iceland, but because I believe that the story of Iceland in the last 40 or 50 years is a fascinating signpost, almost like a laboratory, an example of how we can execute the third method of preventing irreversible climate change by comprehensively transforming the energy system of our country. Because climate change is fundamentally an energy problem. We all know that. The science is clear. The studies have been done. There's really no debate about that issue. If we really want to deal with it, we have to transform our energy systems and somehow I believe that if Iceland could do it, so can everybody else. When people visited my country today and they see the clean energy achievements which I will describe in a few moments, they somehow think it's been an easy journey, that's not true. If you look at Iceland behind this title which I have chosen to illustrate the road I am going to take that it's not really about energy, it's about the economy. It's about the economic transformation of the country to realize that to move from fossil fuel over to clean energy is fundamentally good business. It is fundamentally the road to prosperity and economic achievement and also safeguard against financial crisis in the future because as you might know, my country was hit very hard in 2008 when all the major banks actually collapsed. One of the main reasons why we are now perhaps that country in Europe that has succeeded best to deal with financial crisis is the comprehensive clean energy transformation in the previous decade. But this has been done on, as I will illustrate, not on the basis on a grand plan, not on the basis of ambition or government policy on 30 or 40 years ago. It has been done though localized, bottom-up, profit-driven initiatives and actions taken by small towns, communities, different sectors, companies, and so on. But the end result is an extraordinary transformation. But it started in a country where the capital Reykjavik, about the time I was born, was every day under a black cloud of the smoke from the cold fires and the fossil fuel, where you could smell the energy every day, and everything you hand out in the air made it dirty. And that was the situation in my country. The coal depot was the largest part of the harbor and every week, the vessels came from Britain and Germany bringing coal to our country. It's not all that long ago, at least I kind of kid myself, I'm not very old. And then, for centuries, we have used geothermal water, primarily to wash clothes. That was it. We went out where you saw warm water coming up, you put on some equipment, and as you can see, this 70-80 years ago. We can see it from the clothes the people wear, and they had been doing that for hundreds and hundreds of years. The only usage of this great energy resource was the clothes, occasionally perhaps you take a warm bath or so, but in terms of producing energy—zero. Nothing. And Iceland had been for centuries one of the poorest countries in Europe: a nation of farmers and fishermen struggling out there in the North Atlantic, barely surviving, being through most of the centuries only 40000-50000 people, about 100000 or so at the beginning of the 20th century, people who lived on open boats, worked in the fishing on elementary wage, tried to grow the crops and the hay to feed the cows and the sheep. So the beginning of this transformation into the leading example in the world in a clean energy economy came from a country which perhaps had the greatest odds against it being able to do so. Then it all started, by the time I was born or so, by putting parts in mud streets, in the center of Reykjavik. Few houses in the beginning, then again, see from the dresses of the people in the picture. This is long time ago in our minds, if you look at the style. That's how it began, house by house, street by street, district by district, town by town, city by city, until 30 or 40 years later, the entire country had been transformed. The city covered in black smoke or coal of the time I was born now waits all of you in this way: clean, fresh air, non-polluted, with great modern societies, fantastic lifestyle, one of the best lifestyles in the world, together with all the Nordic countries, where women and men live longer than in most other countries. A fantastic lifestyle in swimming pools and restaurants and everything else—one of the luxury places in the world, if you compare it to the rest of the continent. And of course the statistics are quite fantastic, this is the percentage of renewable sources in energy production, together with Norway, Iceland ranks up there at almost 100 percent. I'm sorry to say that Sweden is far behind, and not to mention the United States. I mean, look at these columns, why on Earth is the United States so low? Remember again the pictures I just showed you about Iceland, the poor farmers and fishermen, the mud streets, the poverty, the grey docks. If anybody had told my parents by the time I was born that there country would be number one in clean energy achievements, nobody would have believed it. It would be a story of impossibility, but this is the reality. And here you can see the transformation, how the relative use on the smaller graphs shows how the coal which in the 1940 and until the 50s was a big part of the Icelandic energy gradually disappeared. Same with oil, and the growth in geothermal and hydro, and you see it on the larger picture also. So now we have the entire electricity production, and the space heating of the country, a rise to a renewable energy resources. And when we get enough electric cars, which I hope we will do in the next 10 or 15 years, we have a good chance of being the first country in the world where all the landbased activity will be run on renewable energy resources. A very strong signal to the rest of the world that it can, in fact, be done. And now the energy companies, and the buildings and the centers have not only become locations to produce electricity or heat the houses, but also educational institutions, centers of information, great tourist attractions. This is the building, the reception of all of the newest geothermal power plants, which receives every year about 20 percent of the tourists that come to Iceland. People who enter this power plant pay an entrance fee to see for themselves what a clean energy power plant actually looks like, and where we have young students teaching the tourists what this is all about. If somebody had even told me 10 years ago that it would charge people to enter a power plant and they would willingly pay about 30 dollars to enter the power plant and receive a tour, I would not have believed it. But that's not the only occasion that illustrates how the growing tourist sector in Iceland is, to a strong extent, based on the clean energy transformation. You have the bore holes at different parts of the country, organized by our experts and engineers and geologists, and planned in such a way that the former comprehensive system that, although its bore hole collapsed perhaps 30, 40, 50 years, then you rest it for a while and you use the others, then you build a comprehensive system that can go on, and on and on. There you see the pipes bringing the steam and the water down to the power plant, which produces electricity, as well as sending hot water into the houses of our capital. And of course hydro power as well is a big part of this transformation. Different in scale because that has been organized by the national power company whereas the geothermal transformation has been more locally based. But this is one of the major reasons why Iceland has become a strong and attractive location for some of the biggest companies in the world. Like this aluminum power plant, initially built by Swiss Aluminum in the 60s but now owned Rea Tinto. Alcoa, as another plant, in the Eastern part of Iceland. And it's worth mentioning that when Rea Tinto, following the fall of Lehman Brothers, stopped all global investments anywhere in the world, and remember Rea Tinto is one of the biggest companies in the world with operations in I think about 150 countries and terminated the entire field of global investments after the fall of the Lehman Brothers. But two years later, they took their first global investment position after the financial crisis began, and that was the modernization of this plant in Iceland, where they invested half of million US dollars in the modernization of this plant. That time Iceland was still considered by many as example number one of a failed financial country, but that did not prevent Real Tinto from modernizing the plant because they knew there was a long term access to renewable clean energy. And aluminum, produced in this way, leaves less carbon footprint than aluminum produced by most other companies in the world. So if you want to have an environmentally friendly electric car, where about half or so of the carbon footprint has already existed even more before you started for the first time, it's better to have the aluminum produced in this way. So, the investment decisions taken by these three global companies are a great testament to the inbuilt global competitiveness of a clean energy economy. And now, in the last ten years, we have added to the data storage centers and I know it, don't I have to explain to the audience, the importance of data storage in the 21st century, and the extraordinary amount of energy which is required to enable us every day to conduct our research and dialogue and communicate with our friends. But you mightn't realize that about 40 percent of the running costs of the data storage center is the cooling. And, contrary to what most people think here Cornell on a cold day, the temperature in Iceland is reasonably balanced in the winter and the summer. So, in order to cool the data storage centers in Iceland, we simply open the window, so you let in the air in the winter and the summer. But they also run on clean energy, and it strengthened the market profile of those who are customers in keeping the data whether they are some of the famous car companies in the world or risk companies or others. They can tell their clients and customers that their data is stored without a carbon footprint. That is an important part of the combination of the 21st century IT technology as well as the clean energy economy. You'll remember the picture I showed you before of the coal, smoke-covered city. Now look at this, this is another picture of Reykjavik today and on the graph, you see the reduction in CO2 emissions simply due to the space-heating from '61 to 2011. This is a remarkable job, not because it illustrates the Icelandic achievement, but primarily because in most countries in the world, including the United States and China, the country of President Obama and President Xi, there are enough low and medium geothermal energy resources to allow countries, cities and urban communities, to exactly travel the same road: to use the localized low and medium temperature geothermal resources to move away from electricity-driven, or CO2driven space heating and air conditioning over to locally based-geothermal energy. This graph is a reminder to all of you in the United States and as well the world to do the same. And as Professor Tester told me this morning, 25 percent of the total energy needs of the United States is for the heating and the air conditioning. A quarter of your energy requirements to match the transformation of the energy profile of this country alone not to forget China and the others, if you did the same thing, which you can like we house by house, street by street, district by district, town by town. So it is, in fact, an extraordinary transformation in a relatively short time of 30-40 years. But as I said in the beginning, the driving motive was not ideology to save the planet, the driving motive was economic profitability to heat the houses and produce electricity in a cheaper, less costly, more effective way, to increase the standards of living of the people, to strengthen the fundamental basis of the economy. It was entirely a market-driven, profit-oriented road. Of course, along the route, we could make our contributions to saving the planet, but that was not the motive. It is perhaps my core message here today, that is makes economic sense to save the planet, and the sooner people discover that, the better. But that was only the beginning of the story to produce electricity and heat the houses, how we have multiple dimensions in our economy to illustrate the profitability of this transformation. We have built greenhouse agriculture, many different parts of the country, producing tomatoes, cucumbers, peppers, you name it, making our diet, of course, much healthier and reducing the likelihood of various diseases and enable us to live longer. But also to help the tourists who come to Iceland to enjoy this extraordinary quality. And I have to tell you, the Icelandic tomatoes are much better than the ones you get here, for obvious reasons. The water is better, but the other is this environment completely without pesticides, completely without any earth, it is done in a way that there is zero possibility of some chemical contamination of other resources. And you only have to taste it once to realize. But there are many other aspects to it, we also grow the bananas in the greenhouses. We have the proud record of having the largest banana plantation in Europe. Admittedly it's under glass in the greenhouses, but still the largest banana plantation in Europe, illustrating that through this energy resource, you can basically create any climate you want. But what has happened in the last five to six years is a very interesting transformation—the people who come to Iceland and visit the power plants and feel they are in a country with fresh air and clean energy, they also go to the greenhouses. They want to see the greenhouses. They want to witness how the tomatoes and the cucumbers grow. So, I'll tell you the short story of a family, greenhouse farm, in the Southern part of Iceland: family of four or five people, husband and wife and their teenage kids. They have been growing tomatoes for about 15-20 years, they're extraordinarily good. But then the tourist companies started to bring people to look at the greenhouses and see how this was done and after three or four years of this, the family said "why don't we charge people?" And they did. But they kept on coming, paying again about 20 dollars to enter a greenhouse and see how we grow tomatoes. And then people started asking "can we taste them, do you make tomato soup?" So they established a restaurant. So the end of the story is, and the story is still progressing, last year 40000 tourists paid to enter the greenhouse of this one family, to experience how through clean energy you produce healthy food. And they keep on coming and keep on paying. And it's extraordinary how we can charge them on many different levels to witness this. We can also give them some fish, which is grown in fish farms where we use the geothermal water to heat up the ocean. And there will be a new one opening and start producing and slaughtering the fish in the beginning of next year. The fish they are producing 2000 tons a year in this one fish farm it's senical sole. Senico sole, as the name indicates, is a warm water fish. You don't need to be an expert to realize that, otherwise it wouldn't be called Senico Sole. And this fish farm is close to one of the geothermal power plants. When they made the deal with the power plant to take the water which before was the fallout water and simply went into the ground and take it to the fish farm and heat up the cold Atlantic Ocean and fool the fish. So the power company which before got zero income from this water that went down to the ground can now charge the fish farm for heating the Atlantic Ocean, 2000 tons a year from this company alone. Then, of course, we come to the drying of fish product. Like almost every fishing nation in the world some decades ago, we through away the heads and the backbone. We just sold fillings here in the United States and elsewhere. And then 30-40 years ago, two fishermen on a boat said "why don't they use the geothermal heat to actually dry this stuff?" Then we can export it to Africa. Drying food is mankind's oldest method for preserving food, but takes a long time out in the air. But through the geothermal technology in a very simple way, you can dry in five days. And after that process, you put it into this Indian very primitive packaging and you export it to Nigeria where you can store it in any condition, even in the local streets, for up to two years, with zero infrastructure. And you can do this for meat, vegetable, fruits. I maintain it will be the single most important contribution to food security in the world if we did this on a global scale. Because about 20 percent of the food produced in the world get destroyed within a week or ten days, not because we waste it, but because there is not a method to store it, because the highly advanced Western way of freezing food and selling it in supermarkets in a frozen way is a luxury of the affluent part of mankind. The other billions on planet Earth can't do that, and if they did, it would cause major environmental problem for the rest of us. So the only way forward is to dry the food, at least if we want to utilize 20 percent of what we actually produce instead of destroying it. And this way how Iceland has shown freeing what we threw away before in this dried form to Africa, everybody makes a great deal of money on the way: the Icelandic fishermen, the fishing company, the power plant in Iceland, the ship that transports to the local vendors in Nigeria, the women in the streets— everybody gets a cut of this chain. To me, it's an extraordinary combination of a clean energy economy and a fantastic way to utilize and preserve the food that we produce. And let's just remember that in this whole debate about destroying the ocean resources which is one of the critical issues for mankind in this century, the big question is not just to preserve the fish stocks, but to make sure we utilize 99 percent of the volume of the fish we actually bring ashore. And I can assure you that this food in Nigeria two years after we dried the cod heads tastes fantastic. So, there are other ways also. This is a company that started a few years ago on the basis of cutting-edge medical research by deciding to grow protein from Bali in greenhouses and sell it to medical institutions, medical research institutions which have used animal stuff before, but that was difficult for many different reasons. This is the first time in history that it is genetically produced in this way. And along the way, they found out that byproduct there was this EGF, which if you put it on your skin, it renews your skin. And now this product is being sold onboard Air France, Singapore Airlines, various other companies, and if you told the people who put the pipes in mud streets in Iceland that 50 years from then, they could compete onboard Air France, nobody would have believed that almost space-age contribution. But it is a formidable example of how this clean energy economy also reaches into the cutting-edge medical research of the modern day, then of course the Blue Lagoon, which is one of the most famous locations around the world. Basically it's a spill-off water from a geothermal power plant, and we charge tourists 40 euros which is about 50 dollars to bath themselves in a spill-off water from a geothermal plant. And the nature of the water and the chemicals is such that you feel great afterwards. And this year, 600000 or so, 700000 tourists, more than thrice the population on Iceland, pay 50 dollars per head to do this. But more remarkably when National Geographic decided two or three years ago to present 25 more remarkable places on planet Earth, Blue Lagoon was actually one of them. But the other 24 were all created by God almighty, they were phenomenon of nature, this was a spill-off water created by engineers and some clean energy technicians. And also, let's not forget the role this has played in the universities, in our science, in our engineering departments, in the research, in the engineering companies that make great business both in Iceland and elsewhere on the basis of the know-how and the technology and experience that they have gathered. Now, this has become one of the great pillars of our research and university community as well as being one of the biggest parts in Iceland's role in the world. We established together with the United Nations University a few decades ago the United Nations Geothermal Training University in Iceland where we take young people who have finished their first degrees from Asia, Africa, and other parts of the developing world and give them a training in geothermal technology in Iceland. And as you can see on this map, this small country has now played a role in all these countries you see on the map in capacity-building and training for their clean energy sector. In China alone and in East Africa, the Icelandic training has been a major part in the transformation that is now taking place in the countries. And if Iceland can do that, a small country which a few decades ago was among the poorest in the world in matching with the great universities and institutions, the United States could do if it follow a similar path. This is a group of some of the graduates, came together in the Global World Geothermal Congress in Bali and it was in 2010, and it was a testimony to the global reputation that Iceland has achieved in this field. Just a few weeks ago, we beat every other country including Germany in the final voting to host the World Geothermal Congress in 2020 —a formal recognition by the entire geothermal sector of the leadership that Iceland played in this field. And I remind you again of the people who stood close to the pipes of this mud street in the ‘40s, and how it all began. Then, let me say a few words about China and Africa. Sinopec, as you might know, is the second largest company in the world, the biggest energy company in China. And following a slow process that started more than 10 years ago, we have now in recent years engaged through Orka Energy, and Icelandic company with international participation, and Sinopec in the gradual transformation of Chinese cities, closing down the coal-powered heating stations and replacing them with locallybased geothermal heating systems. And the fascinating thing is Sinopec has now decided to make this, as you can see from their website, one of their prestige projects showing the way forward. And if the leading company in China in this field, the second largest company in the world, has decided to enter into that kind of historic-making transformation in cooperation with us in Iceland, it is also a signal that this transformation makes great economic sense. That the globally market-driven, profit-oriented way forward is indeed the path that China is taking in cooperation with us and is also being executed under the leadership of President Xi who understood this very early, Vice President, and supported this effort very strongly, both during the period as Vice President of China and presently now during his new Presidency. This is what we look like inside, as clean as a hospital operation room replacing the coal-driven power station that was there before. We are doing the similar drilling in Philippines where the Icelandic drilling company has been operating as well as in other parts of the world. But then Africa, the poor continent, the great future, where the Rift Valley, the countries in East Africa has this extraordinary potential of energy transformation. We have trained through the United Geothermal Program many people from this part of the world, but what is most remarkable that one of the new geothermal global companies in Iceland Grekio Geothermal, with support from some American investments, has now recently finalized an agreement with the government of Ethiopia to build in Ethiopia the largest geothermal plant in Africa, 1000 megabytes. Because of the involvement of American capital in this project, my colleague in the White House and his staff has decided to put this project in Ethiopia as exhibit number one of the success of the Obama power Africa policy, which is fine with us. We are perfectly happy to share the credit with the president of this country. But it somehow made me wonder "why don't we build a 1000 megabytes in the United States as well? Why do we have to go to Ethiopia to join hands in such a great project?" This will enable Ethiopia to become a net exporter of energy to their neighboring countries. Another country in that part of Africa in the world Djibouti has joined the right policies and the project to become 100 percent clean energy, which will be a very important signal to the rest of the world to have together with Norway and Iceland, a small African country as sharing the number one global spot of a clean energy transformation. But then, of course, I often hear, after a tour like this, "yes you can do it in Iceland because you have these with volcanoes and earthquakes, you're sitting on this connection between continental plates, but in my country sits the question there, and unfortunately we is not as blessed as you are in Iceland." Well, you all know this picture of the planet Earth that's like a cheese, which remind us that the pinpoint inside planet Earth is in fact under every country in the world, every continent in the world, every ocean in the world. And we are only living in our very narrow top of almost like a very small face on top, so it's only a question of drilling and engineering and expertise, how to get to this heat. Of course, in some countries it's easier than others, but it has been demonstrated now all over the world that it can be done, given the drilling technology partly thanks to the oil industry in order to enable us to do it. And may I draw your attention to the final statement that 0.1 percent of the stored heat inside our planet would satisfy the global energy consumption for 10000 years. So even if we just got a small percentage of all this, it would be a monumental transformation. Inside the United States, as Professor Tester have so often pointed out in his and other experts' marking of geothermal potential of the United States, you can do this in many parts of the union, both to produce electricity as well as have spaceheating and air conditioning, and don't let us forget that this is also a big part of the energy needs of this great country. Therefore, with the right policies, the road is open to the United States to utilize as we have done the heat which is also under the great United States of America. And therefore, to use the example of Iceland as the reference point, almost like a laboratory where you can see many different ways in which to become economically profitable and is also the foundation for more secure, prosperous economy. And that is why in addition to the sun and the wind, these three basic forces of nature, the sun, the wind, the heat under the ground, are there for us to utilize in many fantastic ways. And we are, my dear friends, just in the early stages of this technological transformation because if you believe all the inventions and engineering discoveries have already been done, that is not true. This is a fascinating road for young scientists and experts to move forward and thereby discover, through this harnessing of these forces of nature, a new prosperous economic future not only for the country where you live in, but also for the planet. That is why this meeting, two days ago, on the Declaration is so important, that's why President Xi and President Obama have come together to show us that indeed you don't have to wait for the international negotiations, there's no longer an excuse if you look simply at the negotiating process, it counts each and every one of us, do it. That is also one of the fundamental lessons of my talk, you can do it in your house, in your district, in your town. And when we complain there is no action in our government to prevent climate change, we should look at ourselves in the mirror and ask ourselves, "why don't I stop in my neighborhood and my community?" Because the technology and the economic motive is already there. So, as I illustrated and could do in greater detail, the story of the relationship between Iceland and China in this field in the last ten years is an extraordinary example of how one of the smallest nations on the Earth and one of the largest nations on the Earth, far away geographically, culturally, historically, and economically, can come together in an effective transformation for clean energy future. And recently the Chinese leadership came to us and asked if we could help them map out building huge greenhouse farms in the Northern part of China, so they no longer have to transport the vegetable from the Southern part of China and could do away with the CO2 emission and utilize, localize geothermic resources in the Northern part of China for their own food production. So, it has often made me wonder in the last 10 years coming often to this country even at hearing in front of the Senate Energy Committee, speaking to many leaders in many different administrations, why we can't have a similar cooperation in the United States. And that's why I think, well Cornell, can together with Iceland, help to bring the United States also forward on this extraordinary journey, so together we can realize that we can, through the clean energy economy, both help to save the planet and enter into a prosperous, fascinating, and strong economic future.